I can’t seem to find photos of two of my favorite things in La Maison de la Vieille Vigne; the statue of Saint Vincent (patron Saint of winemakers) that stands proud in a “niche” in the living room wall, and the huge and gorgeous old key that the carpenter who is responsible for the beautiful woodwork in La Vieille Vigne gave me to commemorate the end of the project. I’ll have to whip out the old camera and go over there on the next turnover day. Anyway, in the meantime, here’s what I’ve got. 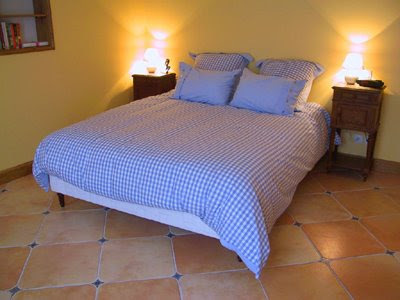 Of all of our properties La Maison de la Vieille Vigne, while boasting some amazing original features like huge oak beams in the living room, ancient stone walls, and an old stone fireplace, is the smallest so it logically has the least number of antiques. 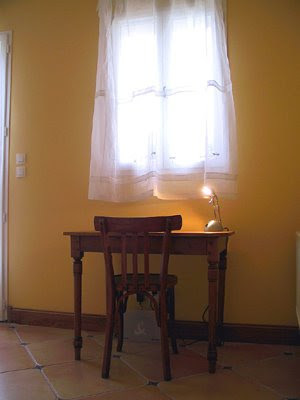 However, I still continue to love this simple pine table and bistro chair that we picked up at a vide–grenier (France’s equivalent to a garage sale), where guests can surf the Internet, scroll through there photos, write, draw, or simply dream. That window looks out on to the private flagstone courtyard. 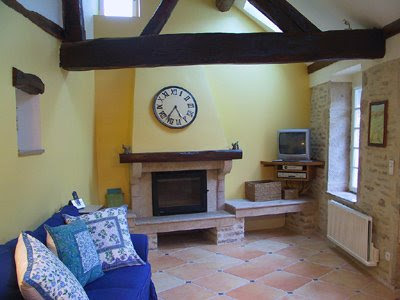 Here is our lovely stone fireplace which heats up the cottage like a hot darn. It has been there for a few centuries, and the stone comes from the local quarry. 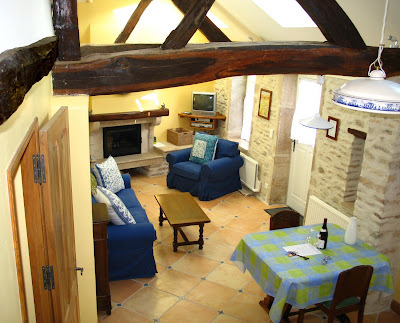 Since this photo was taken we’ve added a cushy armchair by the fireplace which is a nice place for curling up with a book, or hey, we’re in Burgundy after all, why not a delicious glass of wine? 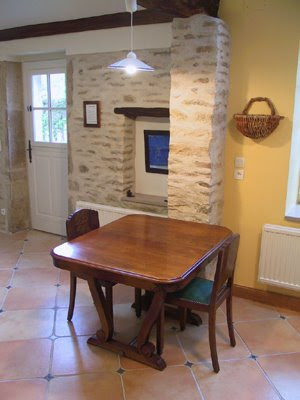 The kitchen table and chairs are typical 1940s french antiques. Well, actually these solid pieces of everyday furniture aren’t really old enough here to be considered “antiques” so they as a rule are still relatively inexpensive. That wicker basket to the right of the table on the wall is filled with corks from all the wines guests have enjoyed over the years. It’s so full we’re going to have to add another one soon! Ah – here’s a photo that shows the armchair by the fireplace, and also the wooden coffee table with spiral legs that we found at one of our favorite brocantes. And we also picked up these cool wooden bedside tables there as well, to go with our new (I never go the antique route when it comes to beds) queen sized bed. 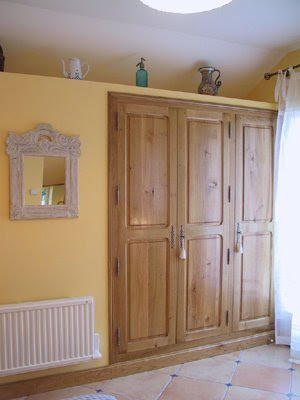 Doing this post has made me realize that I really need to go and do another photo shoot of this property – another thing to add to my very long to do list! This entry was posted in Uncategorized on April 18, 2008 by admin.